I’ve been holding off buying more casting supplies, because I was in dire need of a better way of storing them. 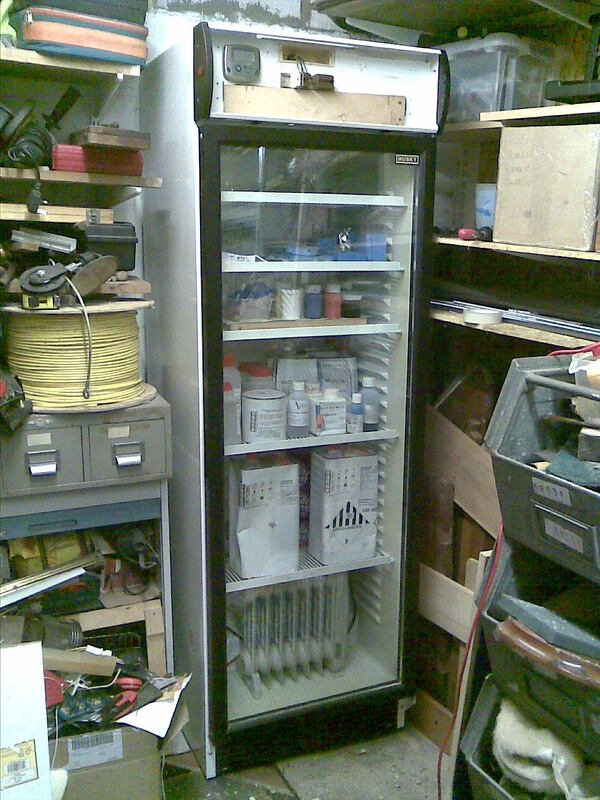 The old fridge-freezer I’d been using was simply too small, and particularly in this damp weather I want somewhere dry and warm to be able to store the supplies where they’ll last longer. 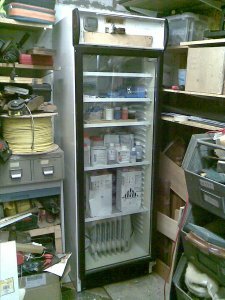 Two weeks ago I managed to grab a large commercial display fridge off ebay, and after a lot of problems with the local garage and our van we managed to collect it. Well actually we got within 0.7miles of collecting it before the van fuel-pump failed (which we’d repeatedly asked the garage to check, but they knew best & instead changed the distributor cap & leads. Not going back there now.). Thankfully the seller brought it down to our van in their car, so we got to get towed home with it in the back. Today I finally managed to get it moved into the workshop. It’s a big square insulated box. The glass door is a small concern, but I suppose it’ll get me to keep the place tidier. 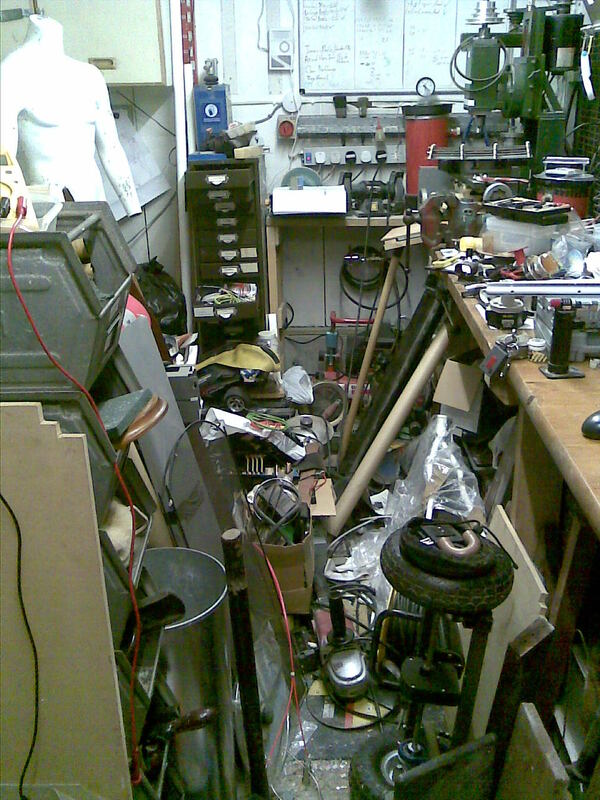 I got the wiring tidied up and moved around. The refrigeration still works, and I’ll be seeing if it’s possible to use it as a dehumidifier. As you can see in the quick cameraphone pic, the oil-filled radiaitor currently takes up a lot of space, so I’ll be seeing it I can improve that, possibly by changing it for a filament heater (though I’m concerned about fire risk). Will be adding a couple of fixed temperature sensors at some point to trigger the fan and try and keep the temp evenly distributed. There’s a hole at the top that also needs plugging, where the neon lamp used to be. Silly bit of design, but easier enough to work around. 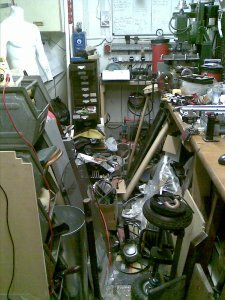 Tomorrow I start work on moving everything I shifted to the other side of the workshop back again, so I can actually use the place and get on with the current orders. So I’ve finally managed to get some bits together and assemble the new smaller degasser. I used the fire extinguisher from the MkI degasser, which I cut shorter. Sadly it’d been out in the rain, as well as having been used for degassing previously. Even sanding it heavily obviously didn’t remove all the traces. I used a nice zinc primer on the inside which seemed to take, but once I went over it with white enamel it refused to bond where the resins had previously splashed. Next time I’ll fork out for some Hammerite. I’m not even sure this enamel will survive cleaning any spatter off the inside later. Found that Poundland is doing rather large tubes of two-part epoxy! Handy stuff to have around. Especially for £6 cheaper than Araldite. It does reek of fish before it sets though. The 99p Shop nearby provided a cheap frying pan which got cut up into the lid surround. Fitted so tightly there was no need for a retaining pipe-clip strap. I brazed a load spreader to the UTA manifold, and glued it on. The nossle holder of the extinguishers base perfectly holds the up-to-air filter so it’s a ready-made support. Without it I’d be worried about the lever-handled ball-valve dislodged the manifold after only a few uses. Made a proper handle from some curved extruded aluminium and some bolts. Again, glued onto 10mm polycarbonate cut to size. I’m unsure if it’ll need internal lighting yet. The white inside reflects a lot of ambient light and it’s not as deep. Will see. So I now have a nice small degasser for using on the workbench! Both controls are nice easy to use lever-handled ball valves. I should be able to leave the pump running to the catchpot and simply switch the two valves for fast control. It should make the degassing of the resins prior to pouring them far simpler. And if one is sealed under a static vacuum, the other chamber can be used under pumped vacuum. One thing to note is that it looks messy because the Poundland 131 epoxy is thinner and slower-setting than Araldite. But if it works, it works, and it seems just as strong when set. As another improvement to the system I also mounted up the MkII chamber, pump and catchpot to a plank of wood. It reduces the footprint a bit but mostly stops them from moving around in use and flexing the pipes which can result in leaks or manifolds breaking. Will try to get a short demo video up on youtube. Just a little something recorded with the new digital camera. The one that you get the video off via USB.